Hi - I'm a carpenter doing a conversion/remodel of a 2 car garage into a 2 bedroom apartment w/ 1 car garage bay. I have a friend that's a plumber assisting with radiant design and boiler install. 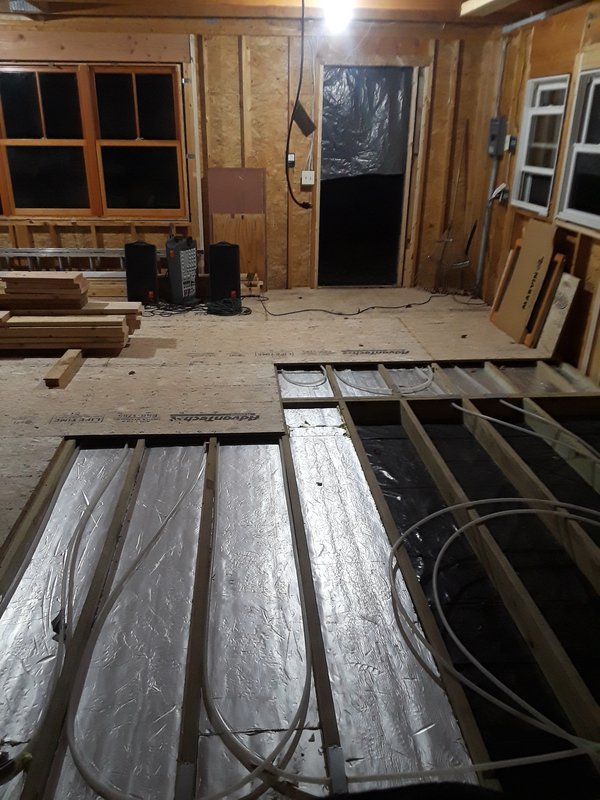 The first floor is a raised 2x6 subfloor with 4" of rigid foam insulation (R-26 total) below it, foil faced, and the tubing laid on top of the insulation, with a 3/4" subfloor on top. The final plan is hardwood flooring everywhere except the bathroom, which will be tiled. This is how our plumber recommended installing it, though I believe that this may be the problem after doing further research (I found this presentation by John Siegenthaler, which I wish I had found months ago http://www.homeperformance.org/file/1449/download?token=Q83qlYtX). The boiler is a NTI Trinity FTV 150MBH Combi unit. 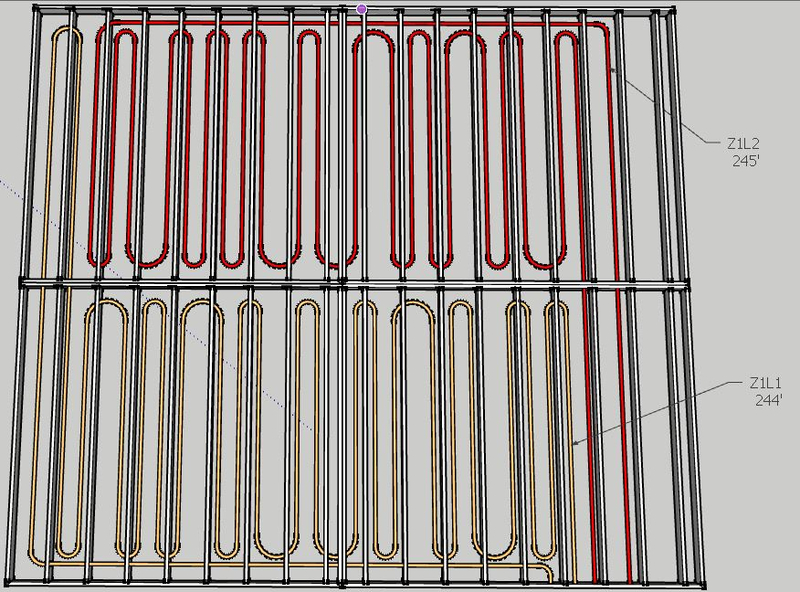 I imagine that all the tubing is potentially doing is heating the airspace below the subfloor, and is not effectively radiating heat up without any sort of reflective plate, especially since it's likely that the tubing isn't even in contact with the subfloor. Here are some pictures of the mechanical room, as well as from underneath the second floor. 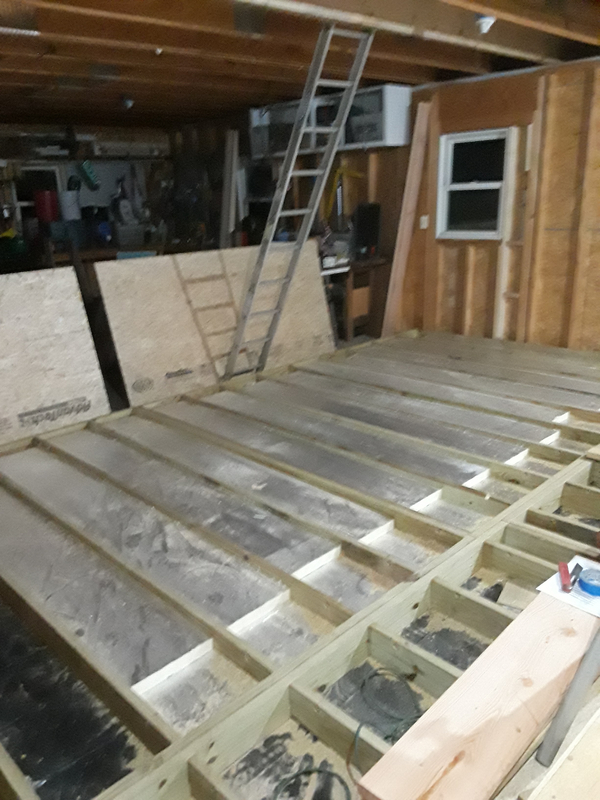 We haven't tried running the second floor yet, but my guess is that since the tubing also isn't in good contact with the subfloor and doesn't have reflective panels installed, it won't perform well either. My guess is that we should install reflective panels - though unfortunately we have put up some ceiling drywall already, as well as insulation in the garage ceiling portion. Siggy is the master of radiant design, you are wise to have found him and to be concerned about your installation. The plateless installations were common in the 90's and I have had to work with many of them. With your installation, if you run higher temps, you can probably get 10-12 Btu/ft out of that assembly. 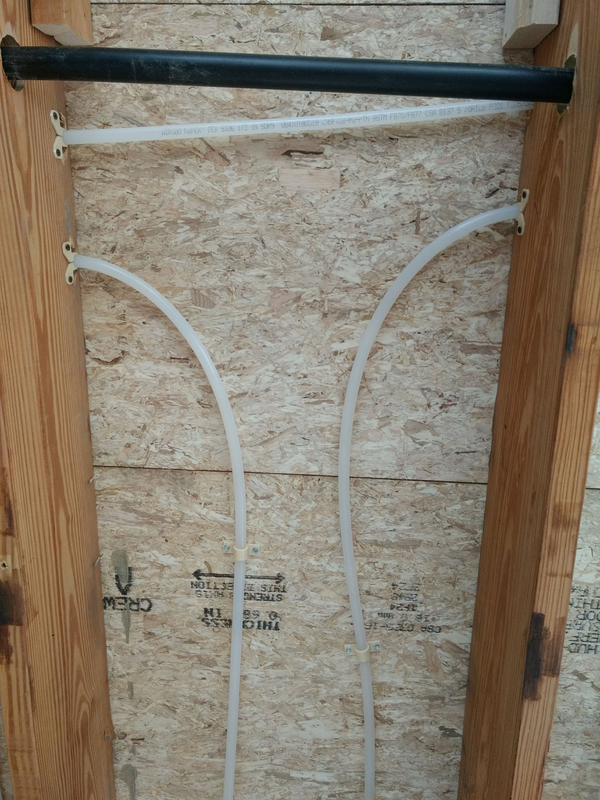 If your building is tight and the heat loss calc is in that range you should be OK.
What concerns me is the the lack of fasteners on the tubing. When you fire the system up from a cold start, it is going to sound like you have snakes under your floor (ask me how I know ). Pex expands alot. Looks like a cross between a suspended tube and a non plate staple up. Both can work if the loads are low as Carl mentioned. UltraFin emitters could be added to increase output, as suspended tube does, as you mentioned heat the space via convection. Adding transfer plates will make a big improvement, then you have the powerful conductive transfer working for you. The foil faced needs to be below the tube a few inches to reflect. If the tube touches it will conduct from the tube wall. personally I don't feel the foil face adds much value as it gets dusty quickly and looses reflective ability. A room by room load calc would point you towards a good fix, to see what you actually need in each area. We had the boiler running at 140, had a deltaT of 15, but couldn't get the room temp above mid-60s. When it kicked on, I didn't hear any noises from the tubes moving actually. The building isn't the tightest yet - haven't finished interior drywall, would like the heat before taping and mudding. Plan B for the 2nd floor is pull the first floor ceiling drywall that's up (which is only 4-5 sheets) and the insulation on the garage side, put up good quality reflective plates over the tubing, and put everything back. 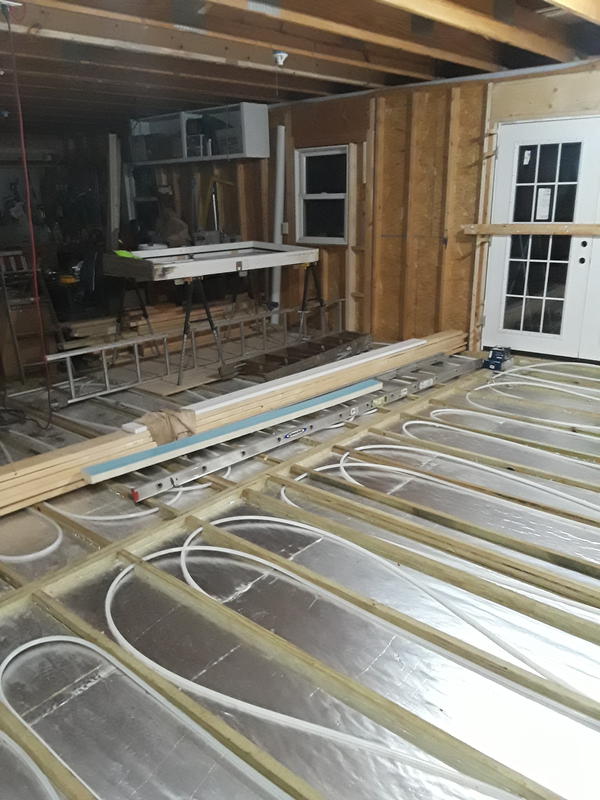 No plan B for the first floor, though Plan C that my plumber friend is suggesting is pull the subfloor, pour gypcrete around the installed tubing to help transmit the heat to the subfloor more effectively. Is that a good Plan B, or does anyone here have better ideas? I have a local radiant designer coming to give me another opinion as well. you could add a dry panel system above the floor also, pros and cons. Gyp adds some mass, noise and fire suppression, adds some weight to the framing. Usually needs to be pumped in by an applicator $$. Dry systems are an easy carpenter install, quick performing buy or build your own above floor assembly. 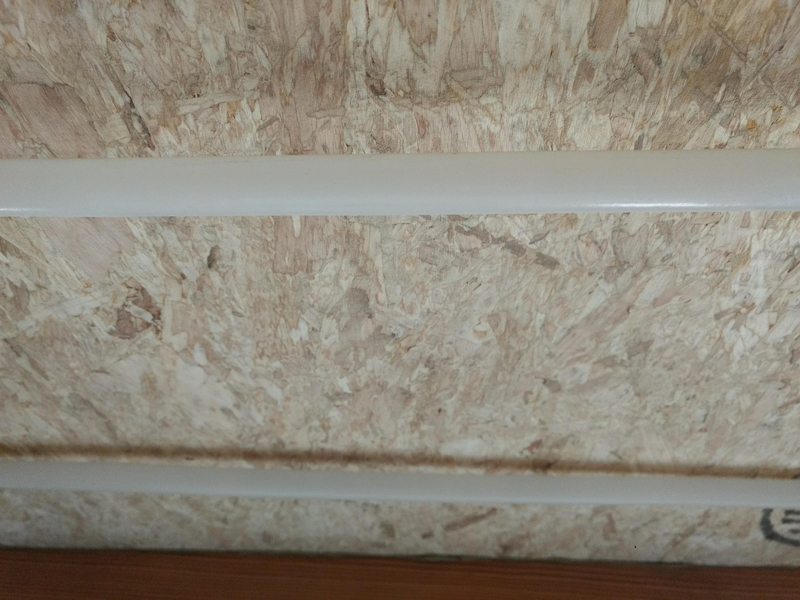 You could also add additional tubing to the ceiling (below the insulation) to help with pushing more heat into the space below. Looks exactly like an internet design from some place in New Hampshire to me. (pick one, they're both bad) They will blame the deficiencies on you if they did it. Bare naked tubing at 16" on center. Conductivity is the KING of heat transfer, and should be used whenever possible. Sorry for your problems. It's problems like this that give hydronics and radiant a bad name. The ability to solder does NOT give you the ability to install hydronics. 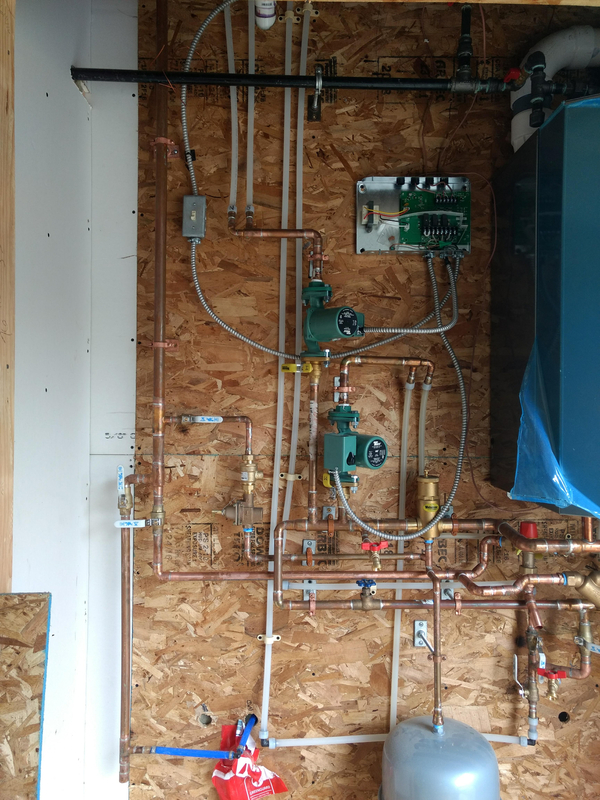 Hydronics and politics are quite similar, if you want your system to perform to your satisfaction, you need to inform yourself and consider your vote carefully. If installer says "don't worry, I know what I am doing".... worry. A competent installer will explain his reasons, with back up numbers, and will listen to your informed opinion. A day or so, spent studying on the internet will save you money and future heartache. There's really only one chance to get it right, and now is the best time. I'd use Uponor QuickTrac or Viega Climate Panels considering the project is framed. Then follow the correct method for floor coverings to reduce R value and increase the floor's efficiency. The pressure reducing valve should be installed in a horizontal piping, not the vertical piping it is in now. Especially if it is a fast-fill type. Read the install paper work to get the manufactures "Notes". 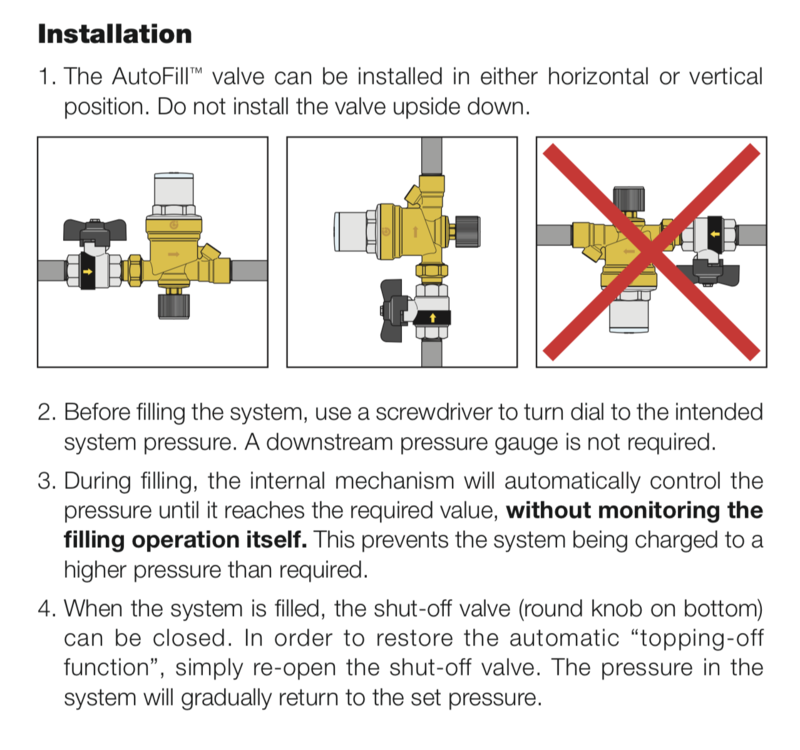 Also, install a shut-off on the boiler side of the reducing valve so you don't have to drain the boiler of its' pressure just to service the reducing valve or backflow preventor. Educate, educate, educate!! I'm not sure about that brand of fill valve, Caleffi can be any position but upside down. 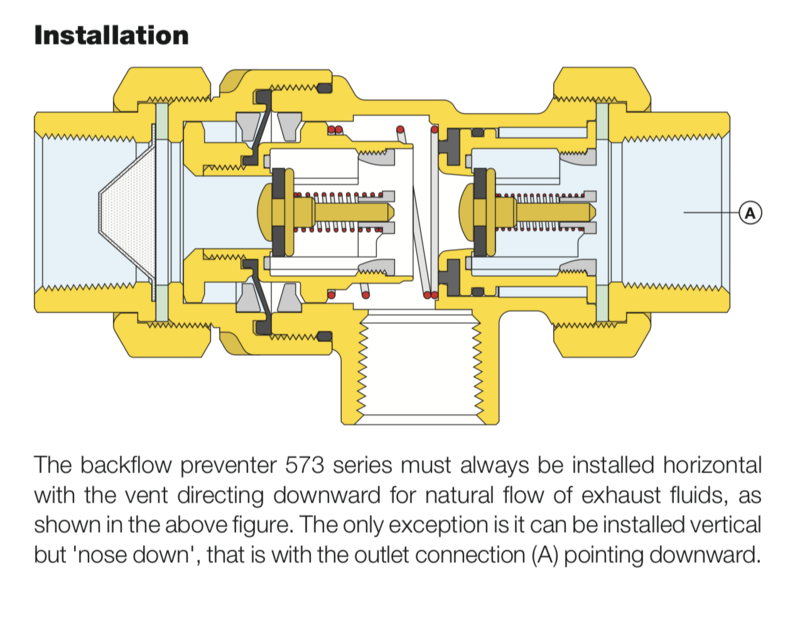 Backflow preventers prefer to be horizontal, however. 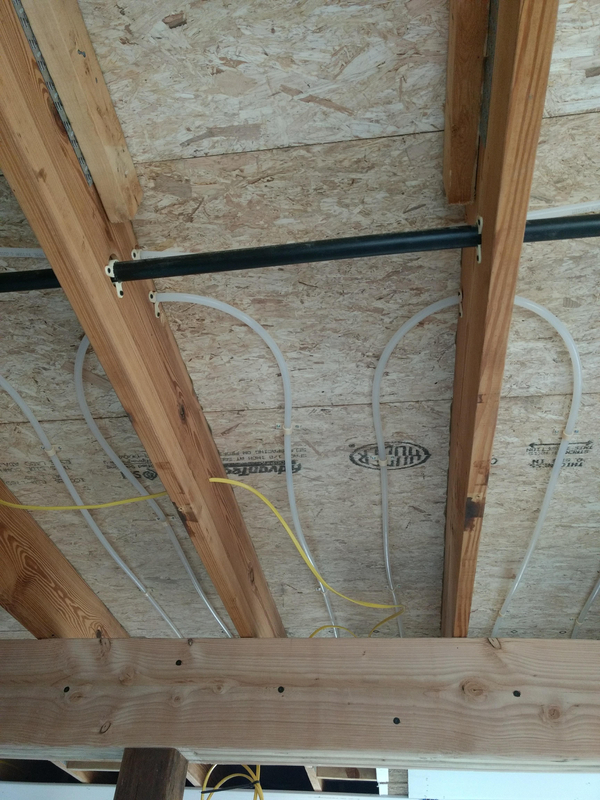 This a common misconception of radiant floors: that the tubing will "radiate" sufficient heat to the floor. It just ain't so! The only place that radiant heat is designed to take place is from the floor's surface to the mass in and of the structure. As Mark said, "conduction is KING". Conduction is what is needed from the water to the tubing, to the the heat transfer medium, to the floor. Then radiation from the floor's surface to the structure (and occupants). 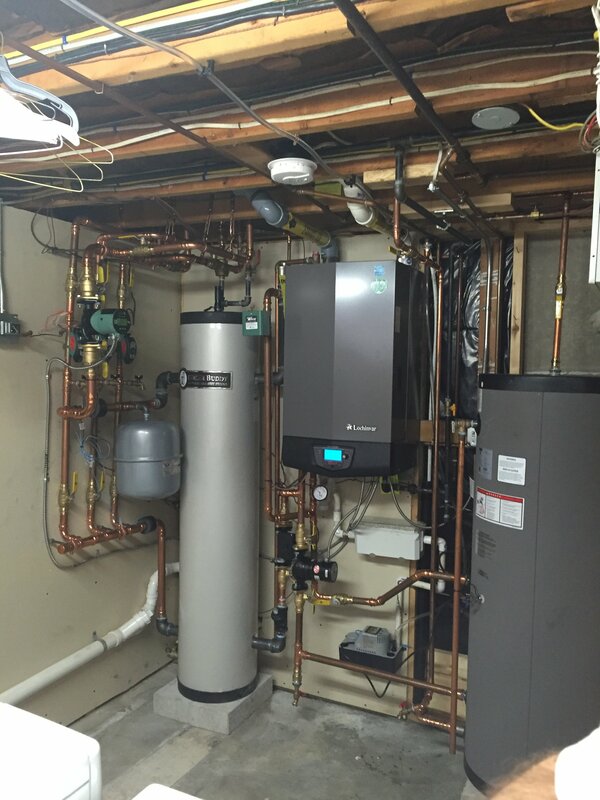 @ererer Can you post a full pic of the boiler and piping? I agree with the above, but looks like the boiler piping is wrong. Unless there is a primary pump under the boiler that we cannot see. I think its a combi boiler so it has an internal pump that will move it around the primary and if he closes the blue handled gate valve the secondary pumps will send it around the tubing. My other thought to this is the tubing lengths and pump size. Oh by the way, I will be stopping in this week to take a look at this, I am the other guy, NOT the original installer. Definitely up the supply temperature to 180F-190F to (hopefully) get the delta-t up to at least 20F. Don't even bother with a condensing boiler in that system nor is it good with a high mass (cast iron) unit. Use a low mass copper tube boiler. Make certain that the cavities are sealed as well as reasonably possible. Also I an a drunk most of the time, I can not stop drinking. Doesn’t look like nearly enough tubing to me... but I’m no radiant expert.